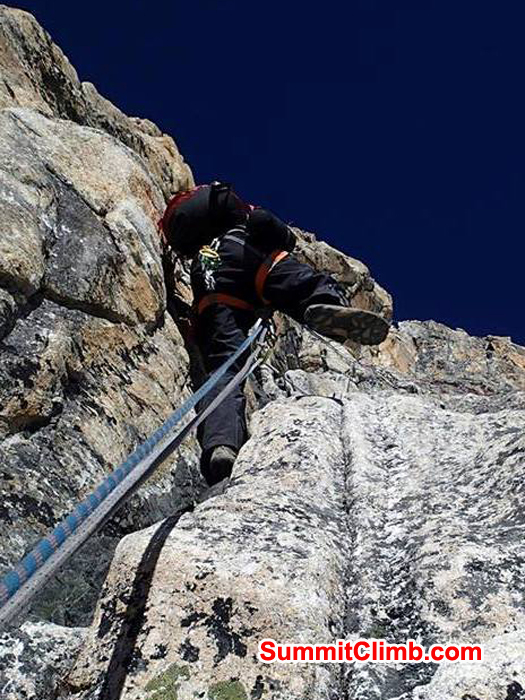 Clear route climbing up from Dablam to Summit of Amadablam. 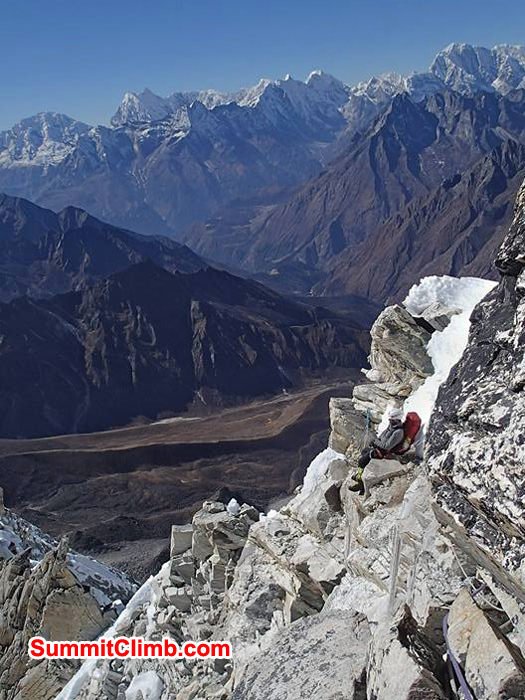 Dablam. Photo: Don Wargowsky. 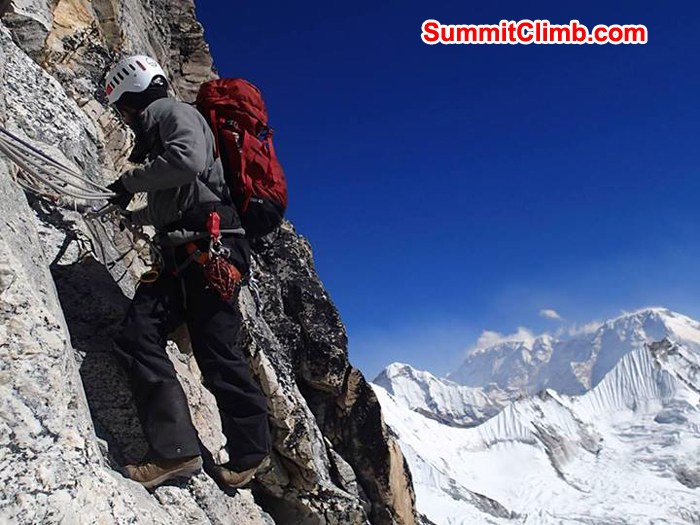 Climber approaching near dablam in order to go summit of Amadablam. The Climber resting while climbing yellow tower. 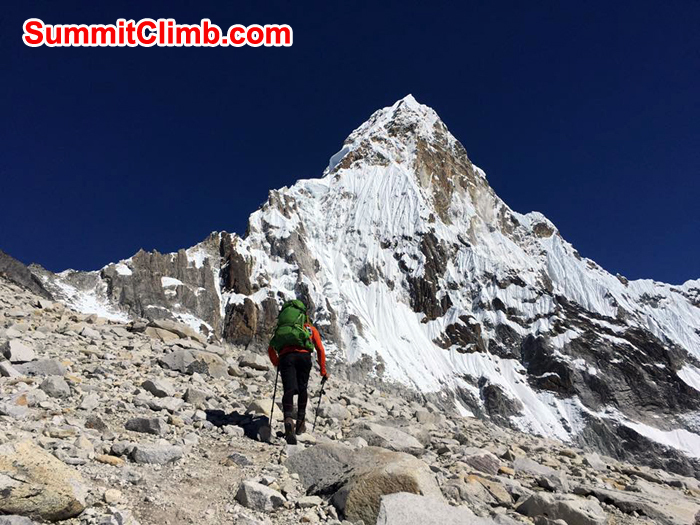 The Famous Camp 2 of Amadablam click by summitclimb member. Photo: Don Wargowsky. 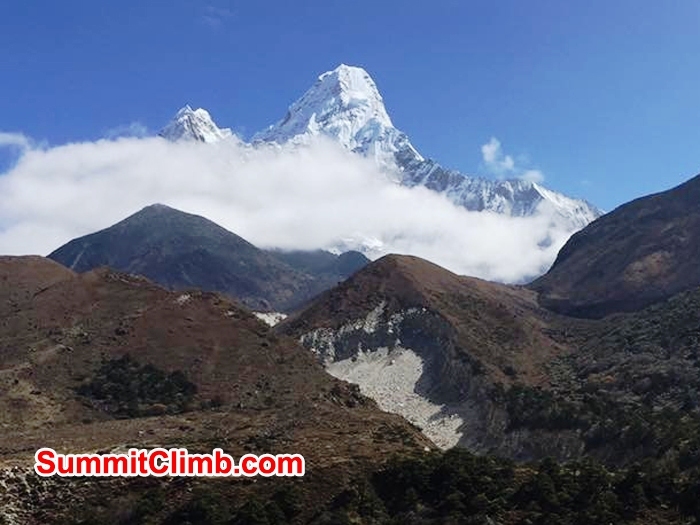 20 Nov - Ama Dablam SummitClimb Newsflash: 2 Members Summit!!! 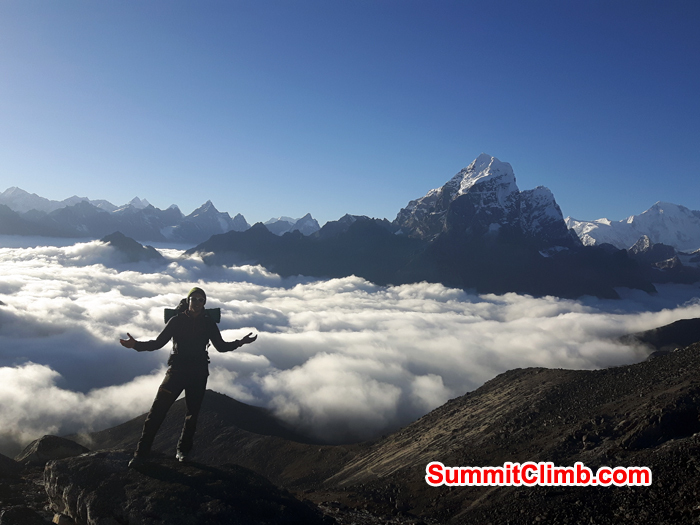 Anna Bolmat and Philipp Hammes just summited Ama Dablam. Congratulations!!!! The other team embers are trying today and we wish them the best of luck. Go Team!!! 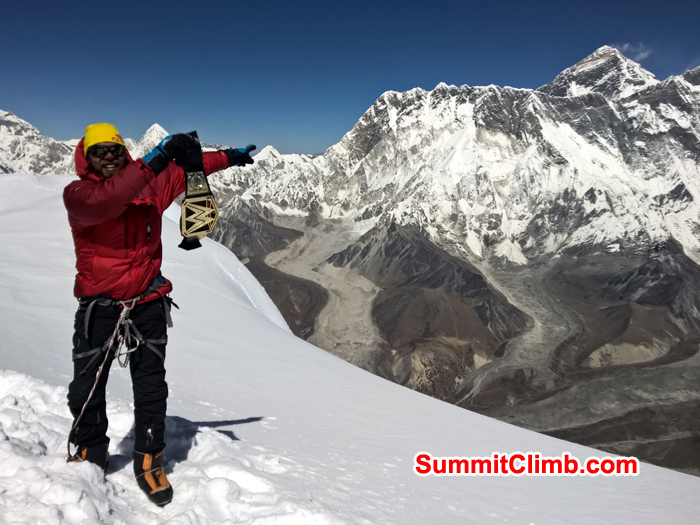 19 Nov - Meeting with Ama Dablam team members and Sherpas. An exciting summit schedule plan. Best wishes for success and safety! 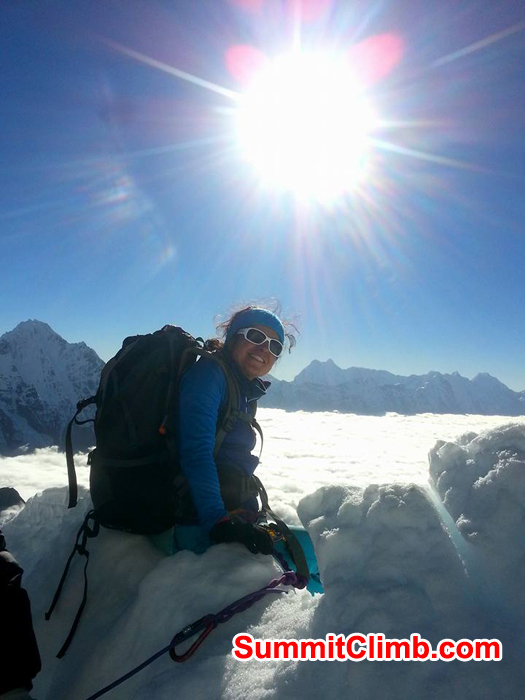 15 Nov - Last night we watched the largest moonrise in 25 years over the summit of Ama Dablam. Incredible! Today we said good by to Andrew, Warwick, Ruby, and Tilly. Miss you guys very much!! 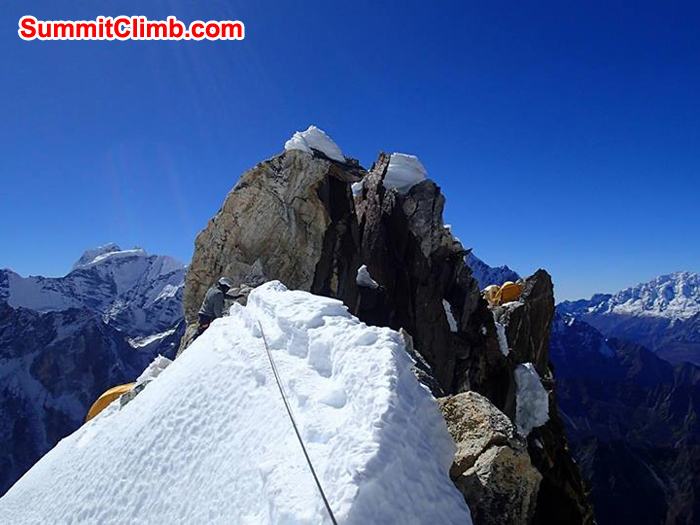 14 Nov - 4 members climbed to camp 1 today. 4 members are resting. the weather is holding: perfect and sunny and warm during the day. cold at night. The forecast says it will stay the same. 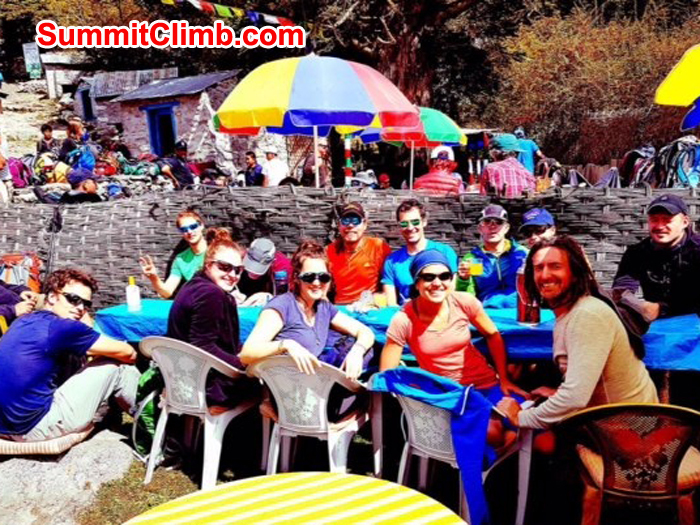 13 Nov - Just lunched with the men and women of our fun Pennsylvania Explorer's Club Island Peak and Ama Dablam Team. They are full of energy and excitement. 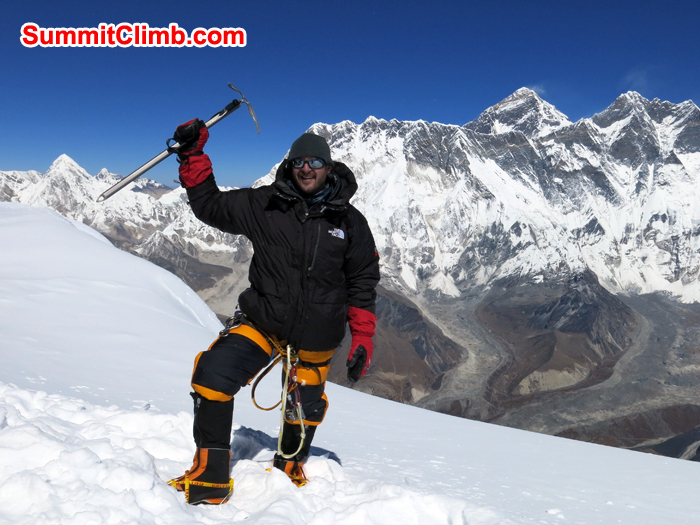 Having finished climbing Island Peak, now onto Ama Dablam. Go Team!! The weather has been superb. Hope it holds!! 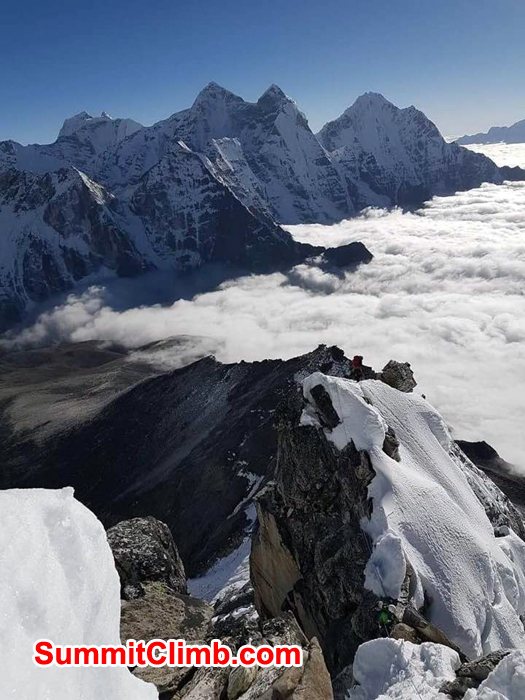 Summit of Island Peak. Don Wargowsky Photo. Near Yello Tower on fixed rope. Photo Don Wargowsky. 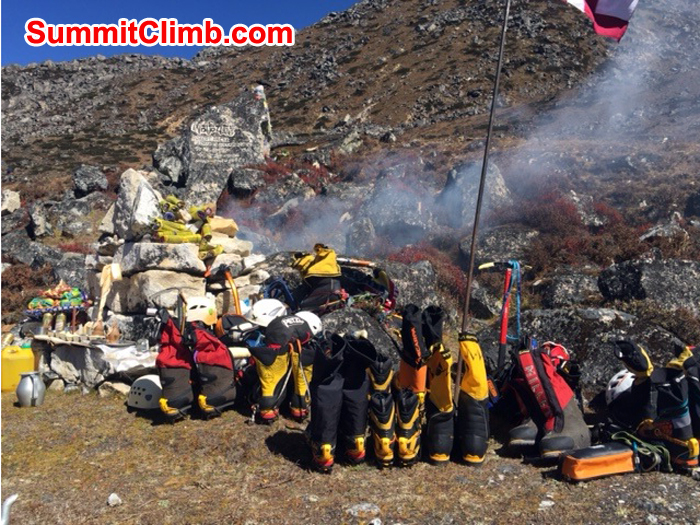 12 Nov - Today 7 yaks went up to Ama Dablam basecamp to retrieve some gear which wont be needed by our november Ama Dablam expedition. 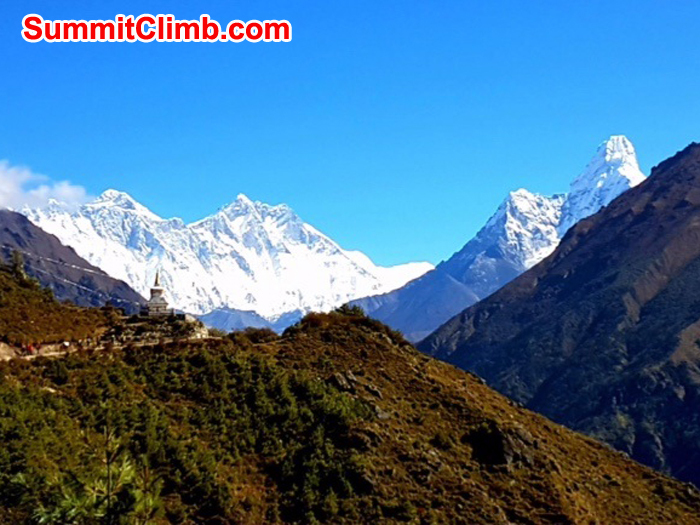 we have a couple of Sherpas down here in Pangboche village carefully checking it and sorting and packing it in preparation for our spring 2017 Everest season, commencing on 5 April. 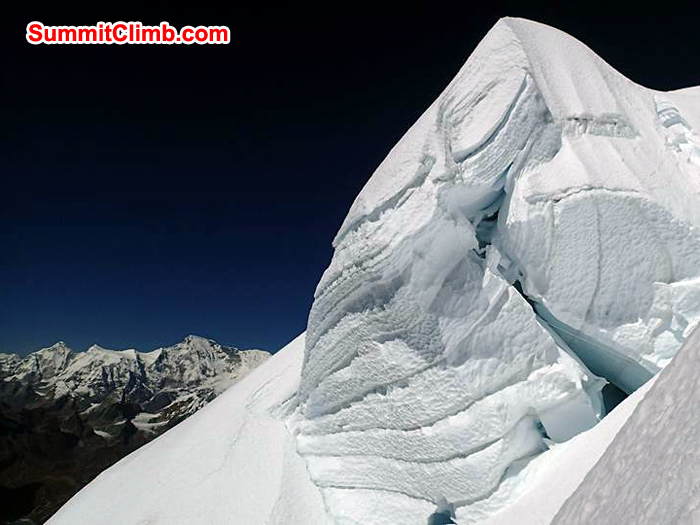 Training Climbs, Summit Climbs, Treks, Bring It On!!! 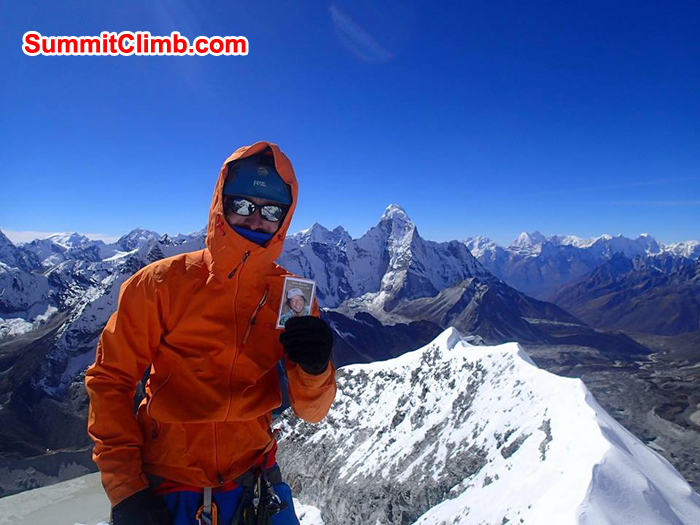 Martin at the summit of AmaDablam. Photo Martin Szwed. 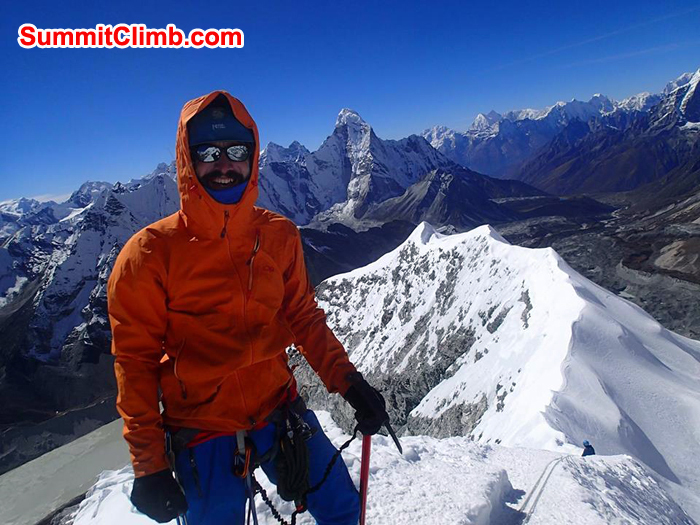 Martin at the summit of AmaDablam. Photo Martin Seljeset. 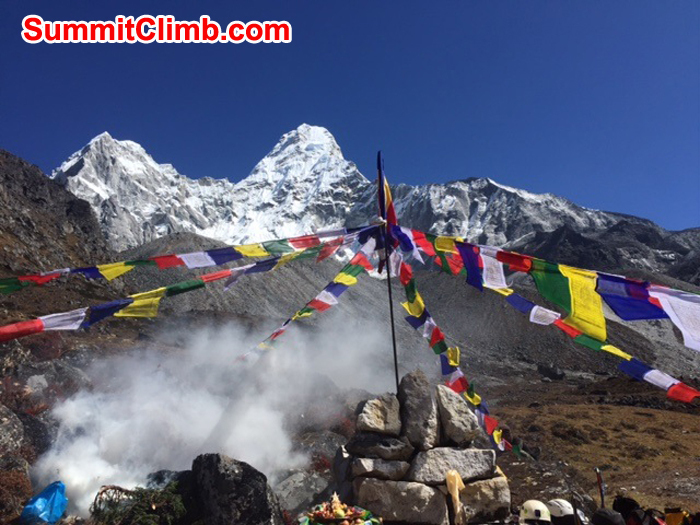 Prayer flag at Summit of AmaDablam . Photo Carmen Larraz. 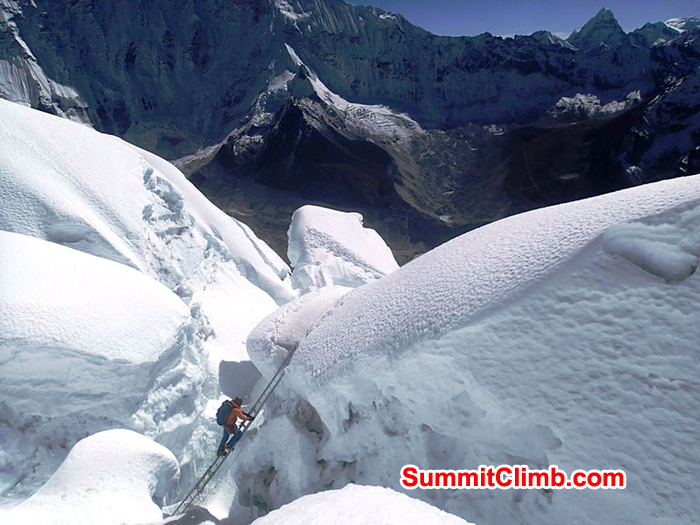 You can see climber at camp 2. Photo Carmen Larraz. Climber climbing up on Yellow tower. Photo Stefan. 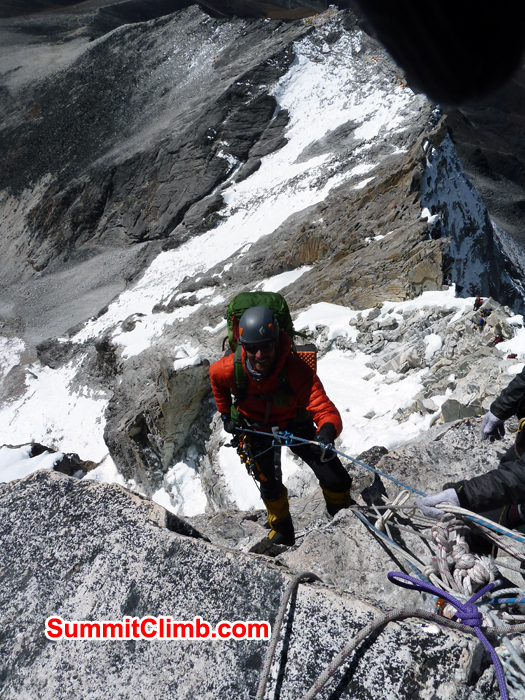 Climber together at camp 2 Amadablam. Photo Carmen Larraz. Bwtween Camp 3 and camp 2. Approximately 2.7. Carmen Larraz. Coming up to camp 2 below camp 1. Photo Carmen Larraz. Do you know here is this. Photo Thorsten Höke. Stafan at camp 2. Photo Carmen. Above the cloud. Photo Thorsten Höke. 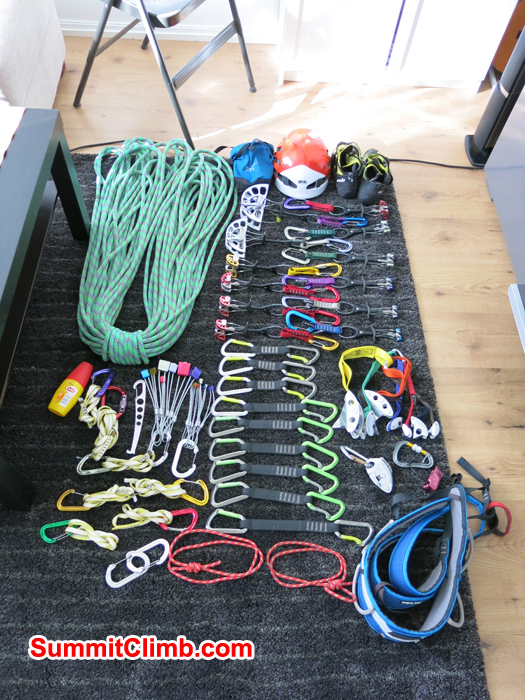 Climbing Equipment for climbing AmaDablam. Photo Martin Seljeset. Martin at camp 1. Photo Martin Szwed. 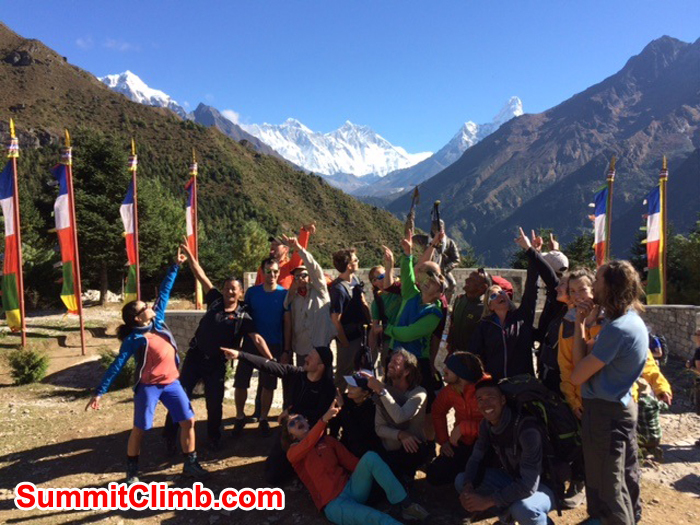 Nov 11- today we visited our november team in ama dablam basecamp. it was very interesting to meet them and discuss their goals and strategies. we checked our walkie talkie communications systems and medical kits. afterward we enjoyed a delicious meal in the heated dining room. The weather is still perfect: cold nights, warm days, no wind!! Our awesome expedition is drawing to a close. 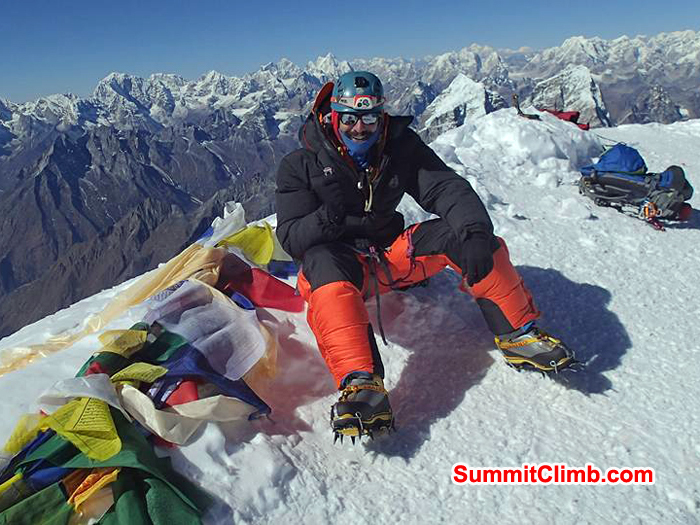 We still have one member, Udai, waiting to make his summit bid on the 5th with Galzn Sherpa. 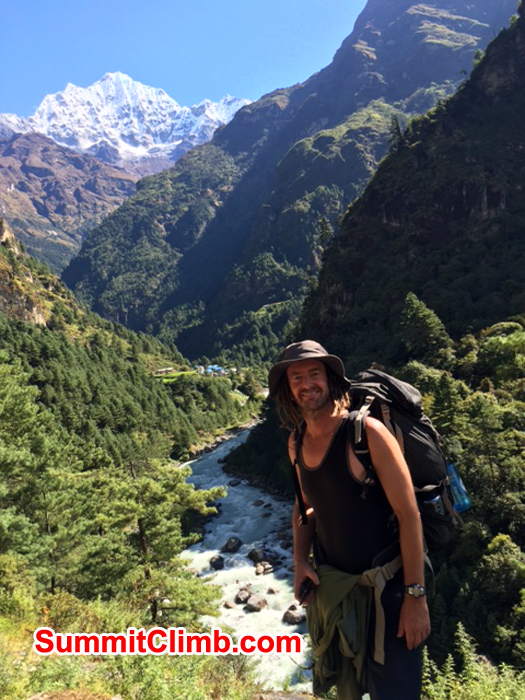 Most of the team are packed up and ready to start walking down to the infamous Namche tomorrow, in time to celebrate Mamens birthday in the evening and Daves birthday on the 4th!! 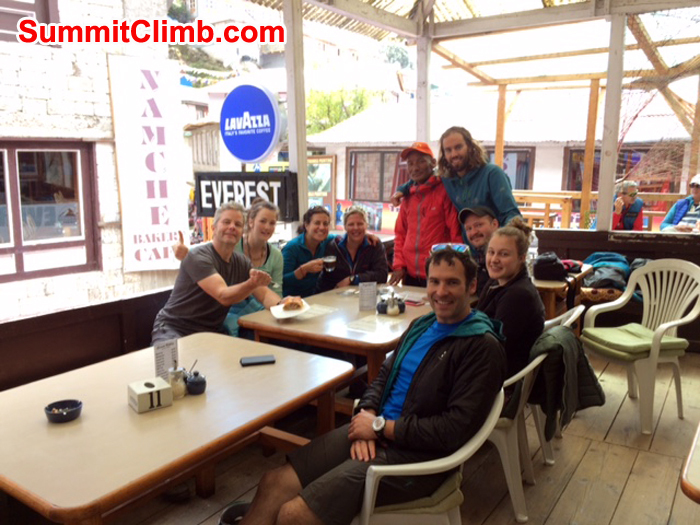 What better place to celebrate than Namche with cake, pizza and beers!!! 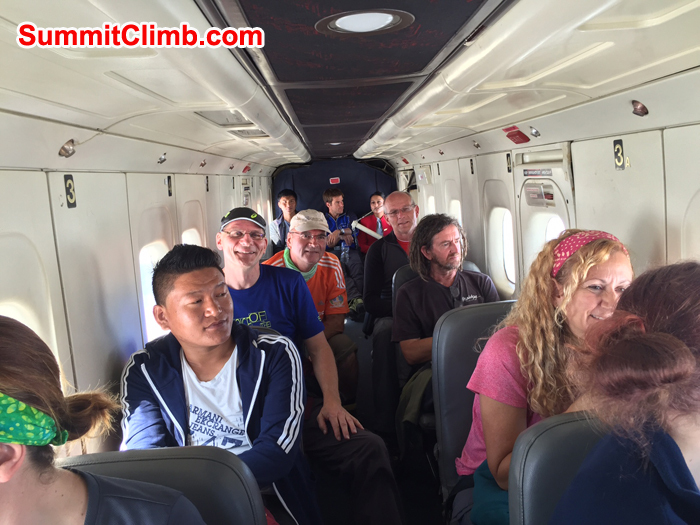 They will then continue walking down to Lukla to catch their flight back to Kathmandu. Tonight was our final dinner where we were all together (except Herbert, Jurgen, Paul & Ed who have already left). The Cook made us a wonderful cake which we shared with the Sherpas and kitchen staff. These guys are seriously talented at whipping up cakes at high altitude!! We ate, drank lots of tea and of course, lots of laughter reminiscing about the trip! None of us can believe almost three weeks has passed since we first met in Kathmandu/ Lukla. Lots of very strong friendships have been made with future plans already to meet again! 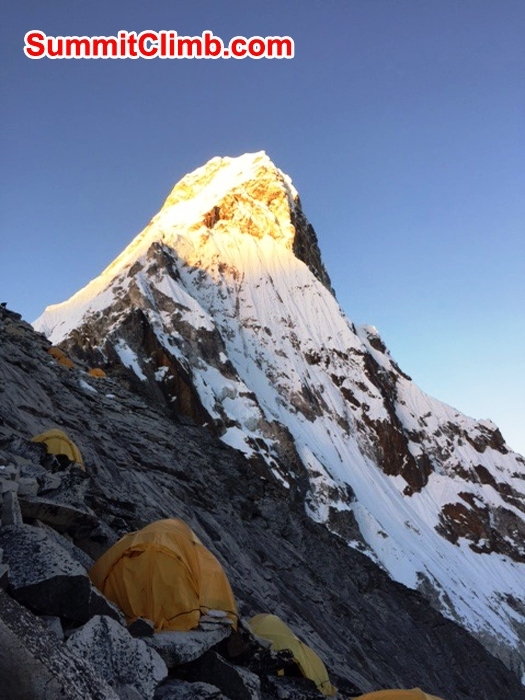 We have been so fortunate with the weather throughout the expedition, with beautiful sunshine lighting up the magnificent mountain which has been a perfect backdrop to our basecamp 'home'! Everyone is happy, healthy and I'm sure looking forward to a nice hot shower and some basic comforts once again! Thankyou all for making this such a memorable trip! 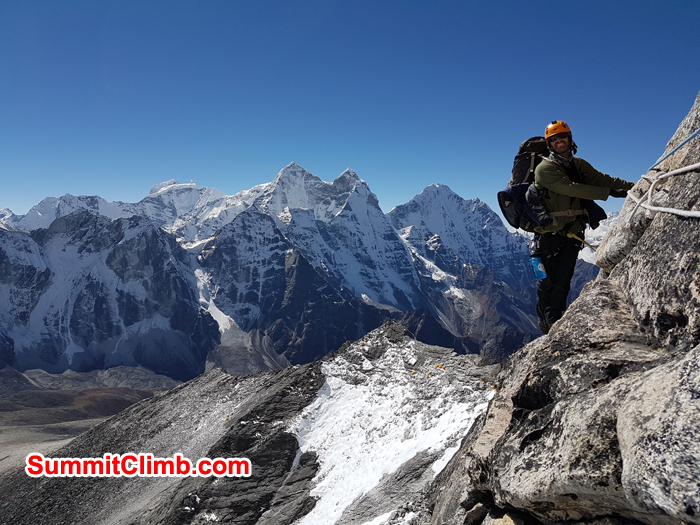 Team at the summit of AmaDablam. Photo Holly. 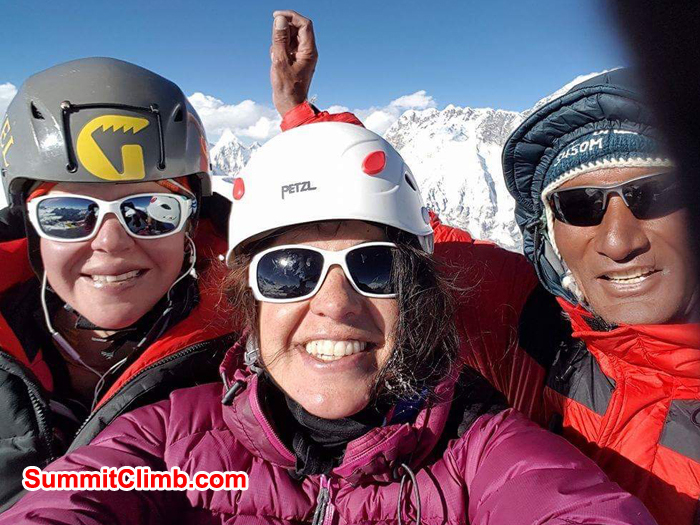 Holly, Carmen Larraz and Lakpa at the summit of AmaDablam. 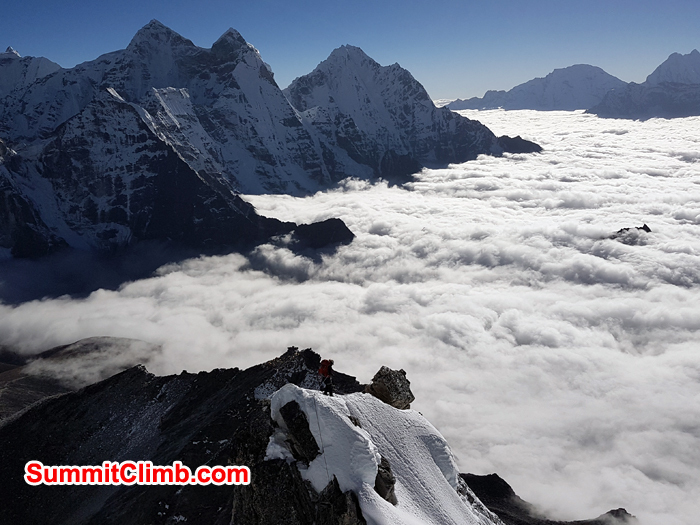 31 Oct - The Third SUMMIT team of Wolfgang Heydenreuter, Thorsten Hoke and Chawong Sherpa left C2 at 11pm and reached the summit at 8.30am, they are now just below C3 and making their way down. 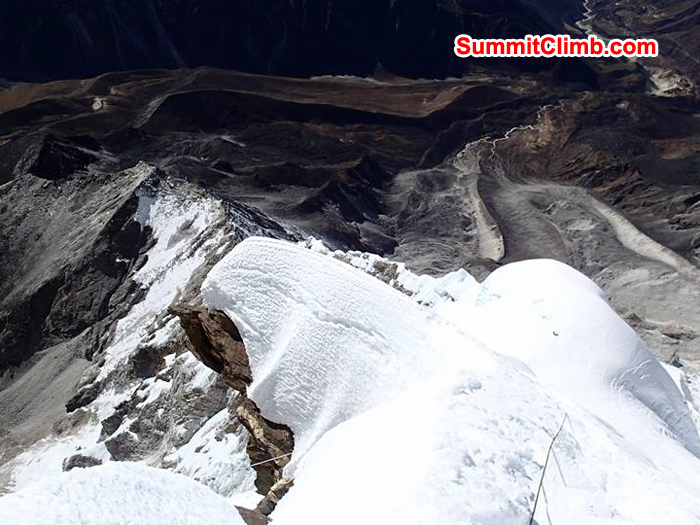 Felix Berg, Magdalena Wilczek reached the SUMMIT at 11.30am. More photos and comments to report from these guys when they have reached camp. 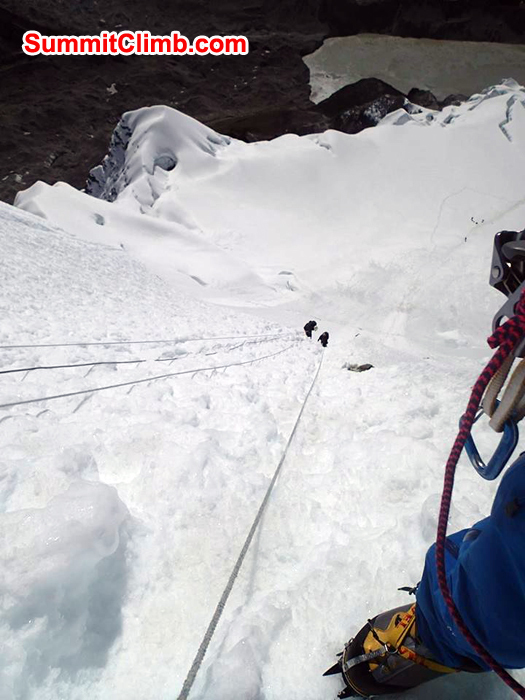 30 Oct – Report from Expedition Leader: Second Team also SUMMITED. All Members are doing well. 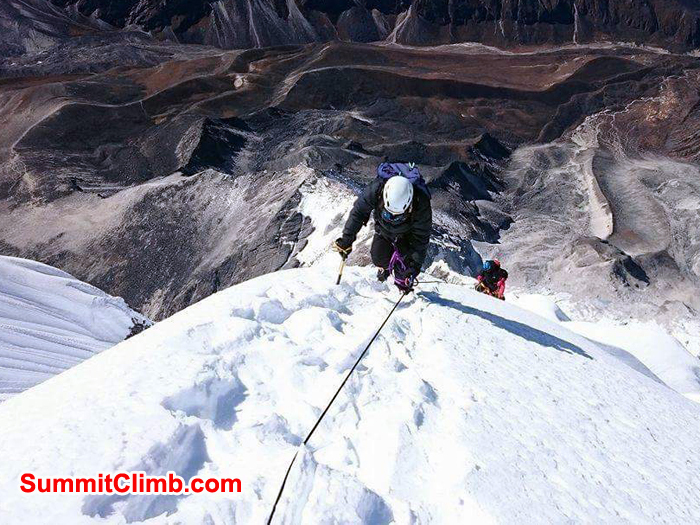 We will provide a full list of those who reached the summit once we return to basecamp. 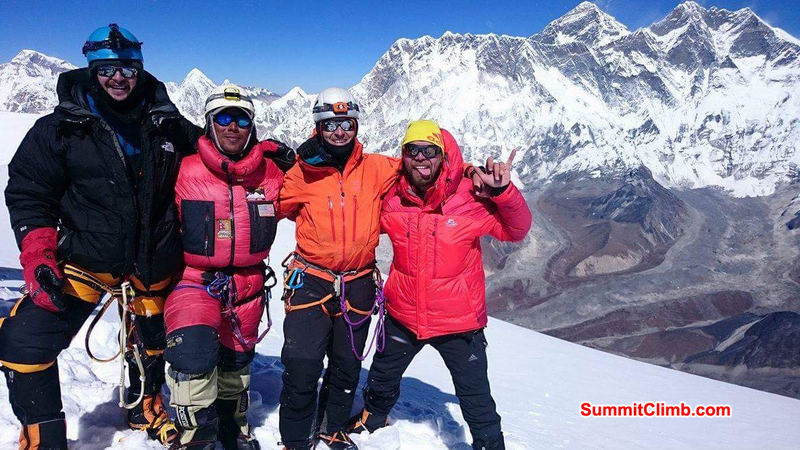 The second successful summit team was Holly Budge, Mamen Larraz and Lakpa Gelbu Sherpa. 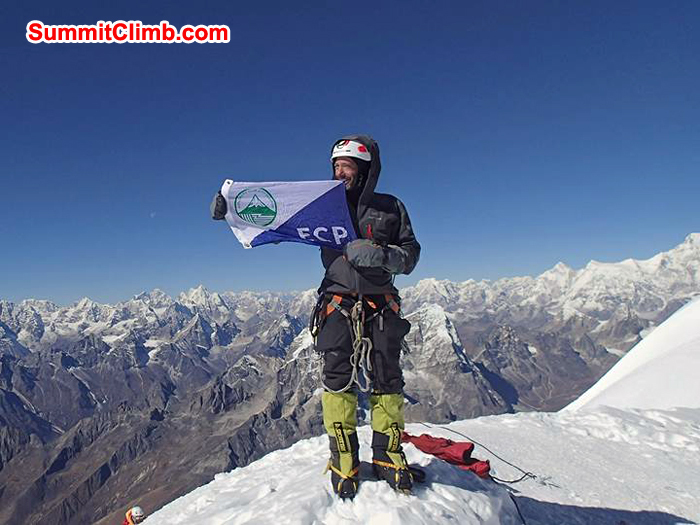 They left C2 at 12.30am, reached the summit at 3pm and returned to C2 at 11.30pm. 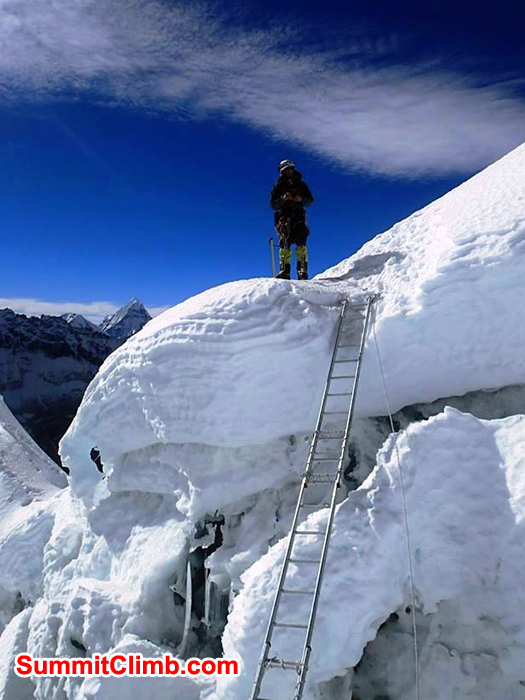 It was a long summit push but all the team were well and enjoyed the climb immensely. 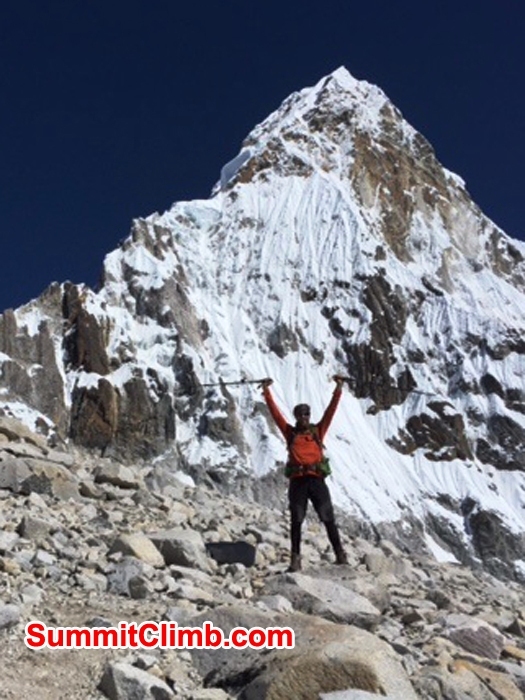 Mamen says this has been her dream to stand on the top of this mountain for 5 years! Today, her dream came true!!! Ed Buckingham turned around at C3 at 8.30am of his own accord and returned to C2. 27 Oct - Team 1 all in Camp 1, Fed, watered and going to sleep. Pretty windy. 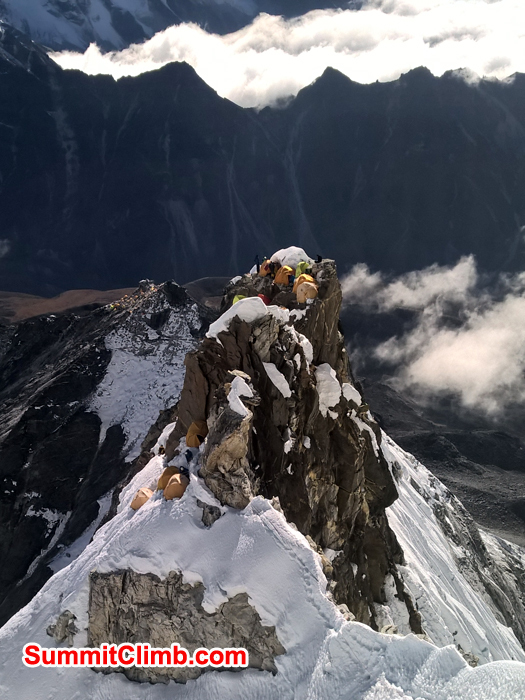 3 members, Martin x 2 and Edward summited today with Tenzi Sherpa. Good work guys! 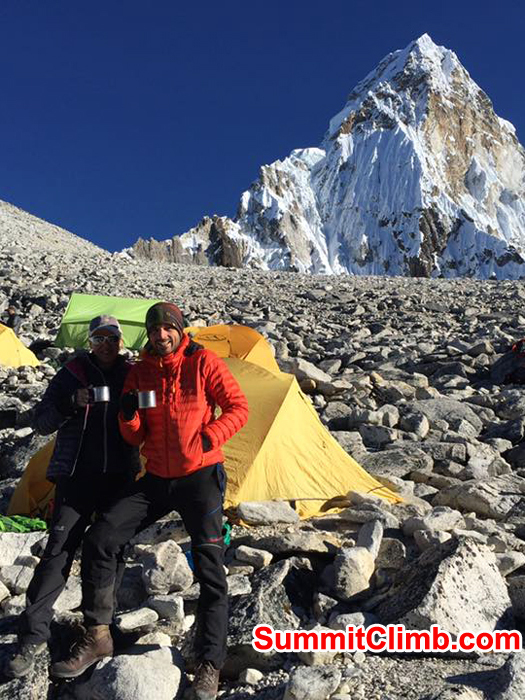 The rest of the team are having a couple of rest days in Basecamp after their acclimatisation trip to Camp 1 and Camp 2. Everyone is doimg well. 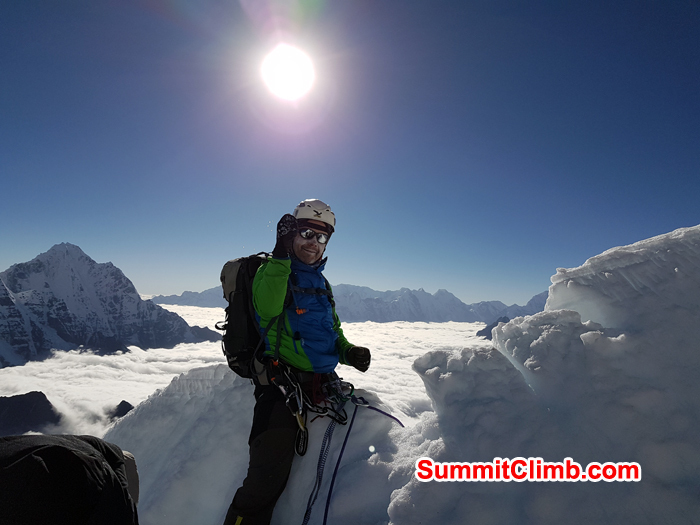 They left C2 at 2.30am, summited at 10.30/11am and returned to C2 by 3.30pm for Martin Szwed, 4.30pm for Edward and Martin. Martin Szwed said it was one of the best climbs of his life. 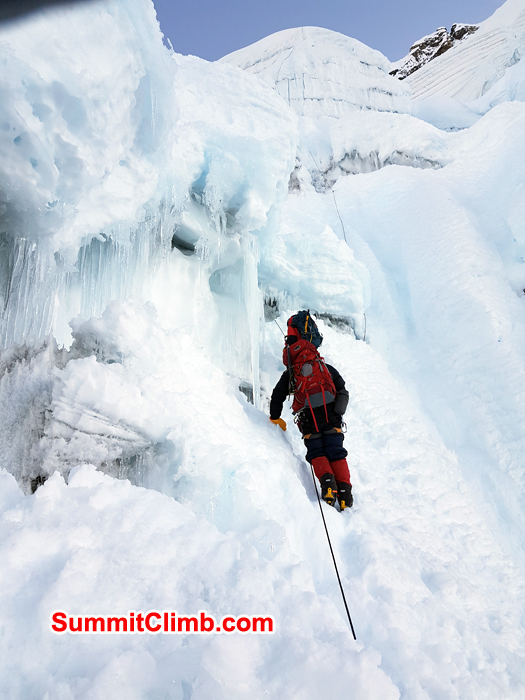 Edward thought it was a nice and interesting climb with a beautiful view from the summit. 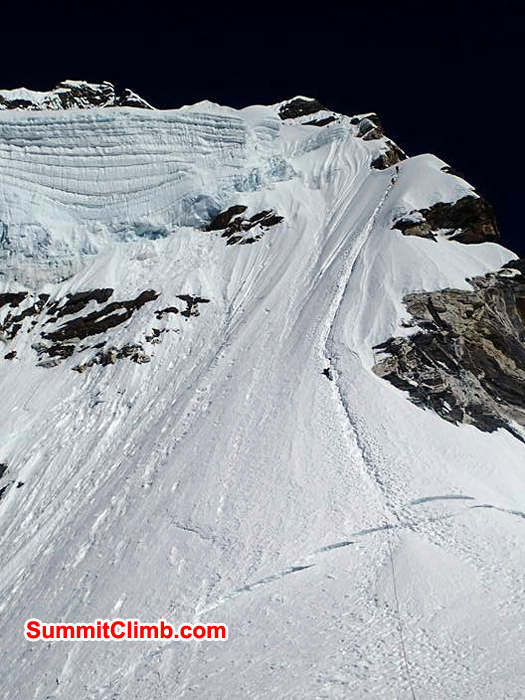 Panaromic view from camp 1. Photo Dave. 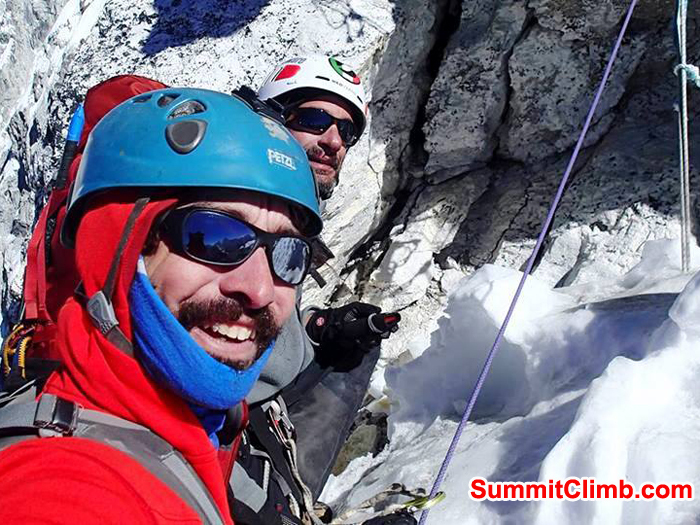 26 Oct - Day 15 - By Mamen Larraz Second rest day before leaving for summit attack. First of all good morning hug to everyone! Tomorrow we are leaving to camp 1, then camp 2, then... summit. Excited and at the same time difficult to believe. 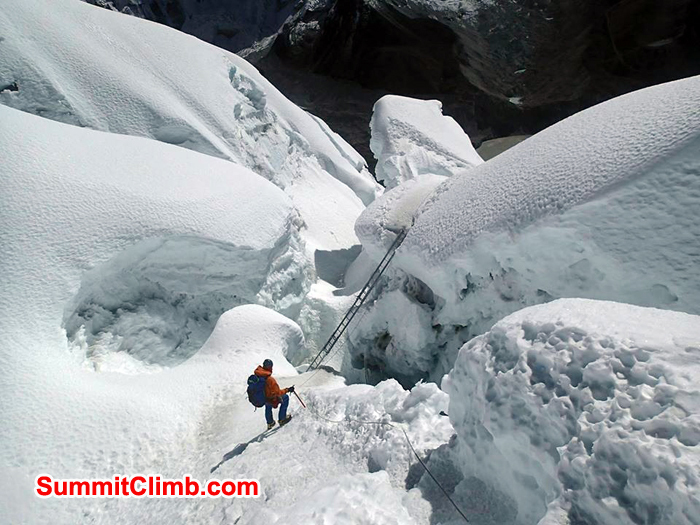 We just saw the fixed-ropes-Sherpa-team almost getting to the top. This is really going to happen! This means that the second rest day is special; the sun is shining, perfect weather, we are all in a good mood, chilling out and listening to Dave playing the guitar and playing around with the few air we still have. 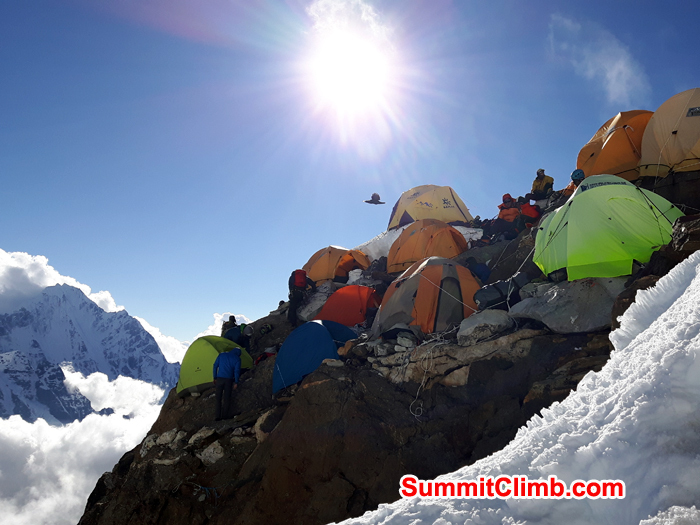 Then comes the serious meeting on preparation for the hard days to come... we have to prepare ourselves, specially psychologically, for the very cold and strenuous summit night and day. Good thing is the team, each individually is great, but together I am sure we are amazing and we can rely on each other. 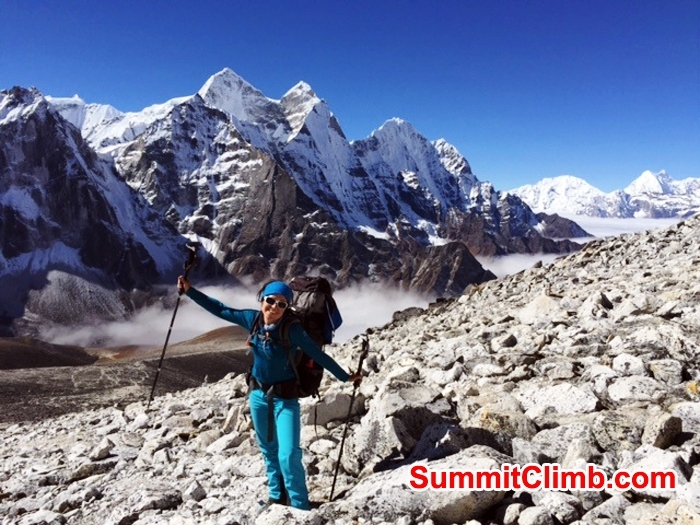 The last days, acclimatising, "suffering" and enjoying together have helped. I like it a lot! Mamma mia, here we go again. Let's spend the last relaxing foggy afternoon and night in the lodge laughing together and.. . Let's make it happen! Love to all from the base of the most beautiful mountain in the world! between camp 1and camp 2 call yellow tower. 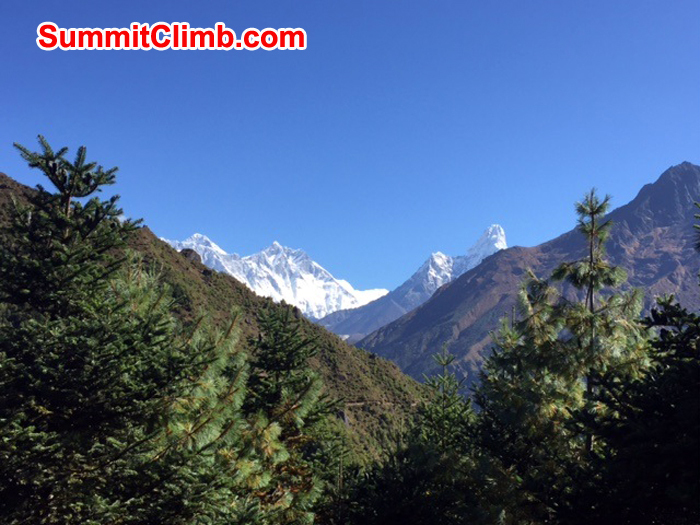 approching near to camp 1 amadablam. Time to reflect the last few days spent at Camp 1. 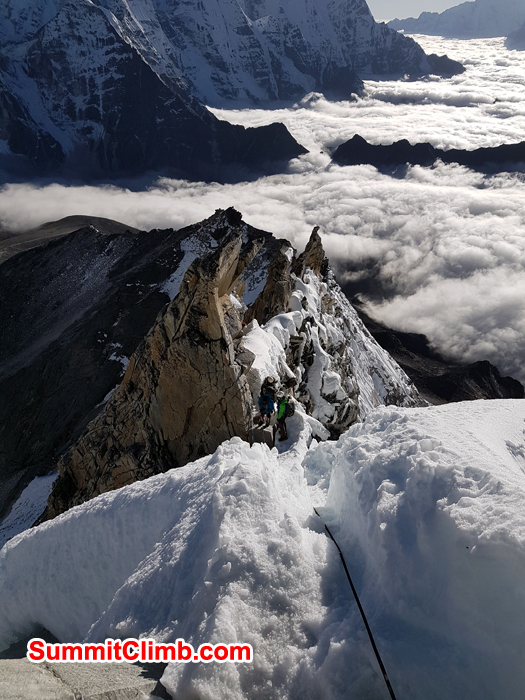 When we first arrived at Camp 1 it was pretty inhospitable with tents set on the side of a rock cliff and going to bed on just chicken noodles was insufficient after ascending 1200m of ascent. 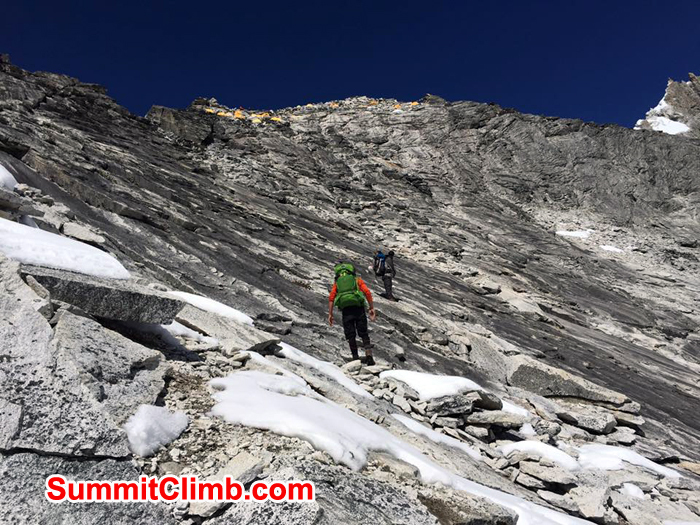 The 23rd saw us do a carry to Camp 2. This turned out to be a hard day on the fixed ropes using the jumar and figure of eight on the way down. Camp 2 is pretty grim with the smell of urine, rubbish and little space for tents. After dumping the gear it was time to return to Camp 1. It was a mixture of abseiling and arm wrapping. We got back into Camp 1 in the dark. For me I was hungry and dehydrated and not feeling particularly chipper. The 24th saw us return to BC. Fingers crossed the next time will be for the summit push. 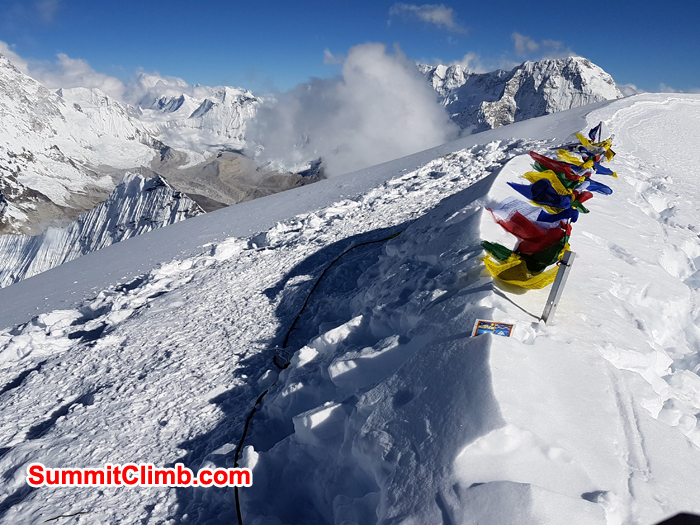 The ropes have started to be fixed but the sherpas have had to stop today 25th because it is cold and windy up high. 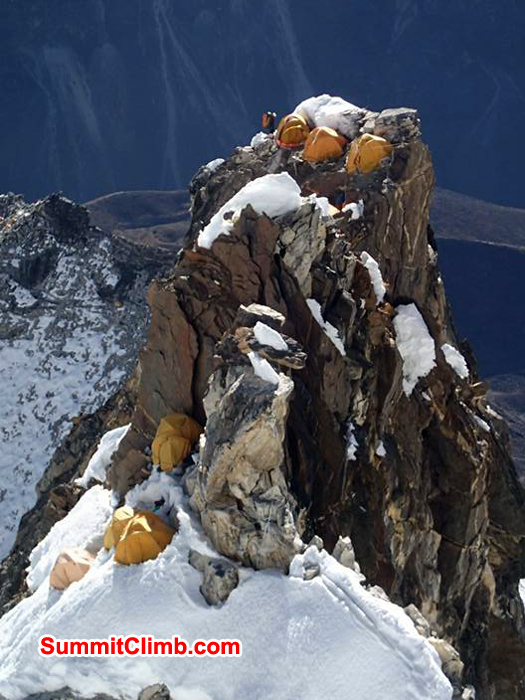 Two clients are hoping for a summit push on the 26th whilst our group is acclimating at Camp 1 for two nights. 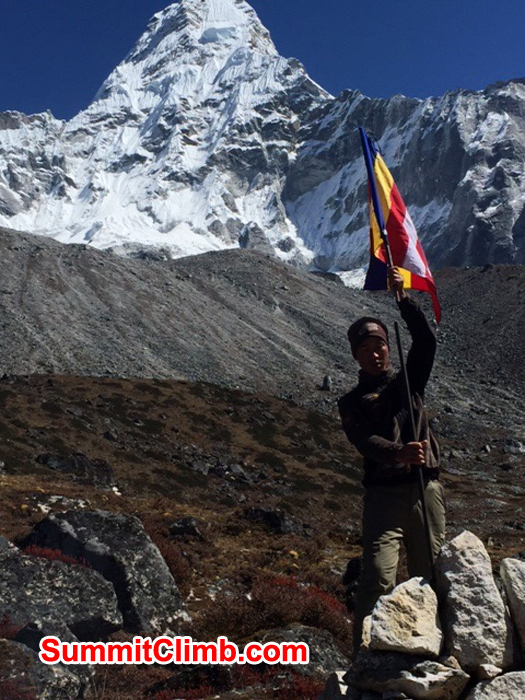 One client has had to go down to Pangboche because he is still sick. By and large nothing unusual is happening in the mountains with gear, client and contact by radios sporadic. 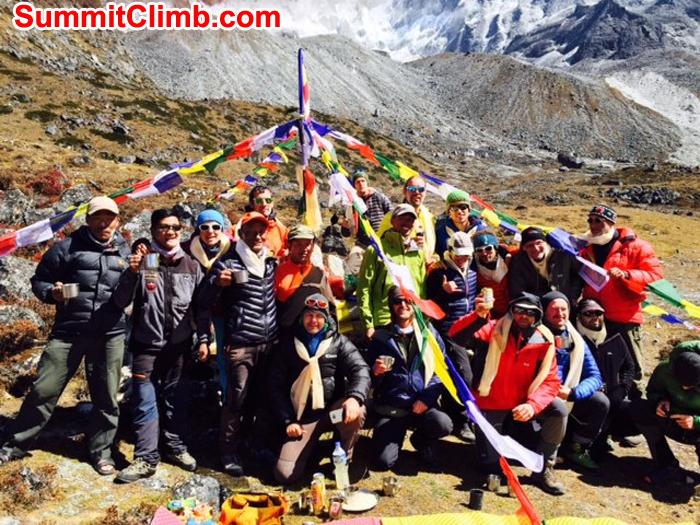 24 Oct - Day 13 - Today Team 1 hiked down from Camp 1 to BaseCamp. All of the team are now in BaseCamp for a couple of days rest. The other two teams are either in ABC or Camp 1 tonight acclimatising & some will visit Camp 2 tomorrow. 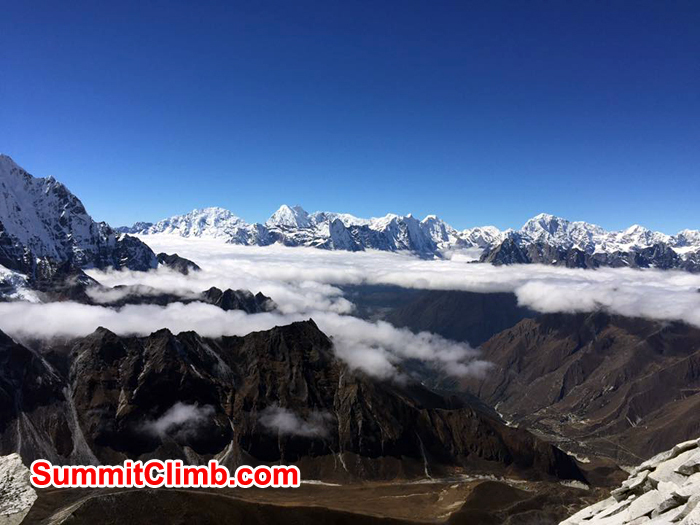 The fixed lines from Camp 2 to summit has started being fixed today. 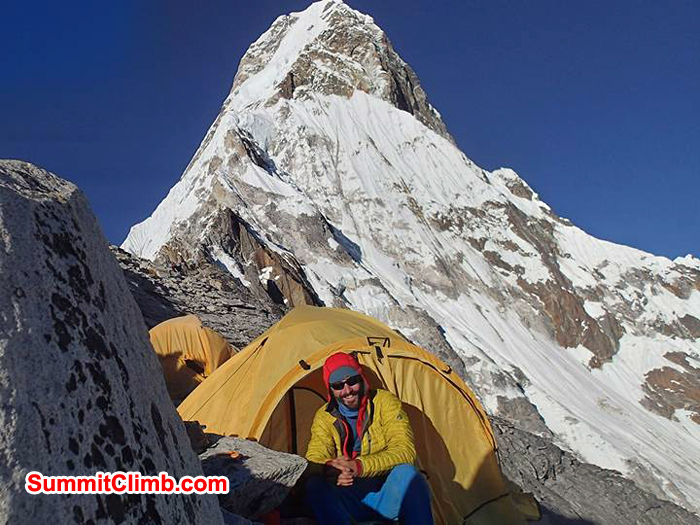 AmaDablam Camp 1. Camp 1 with Camp 2 in the distance. 23 Oct - Day 12 - Team 1 went from Camp 1 to Camp 2 today. 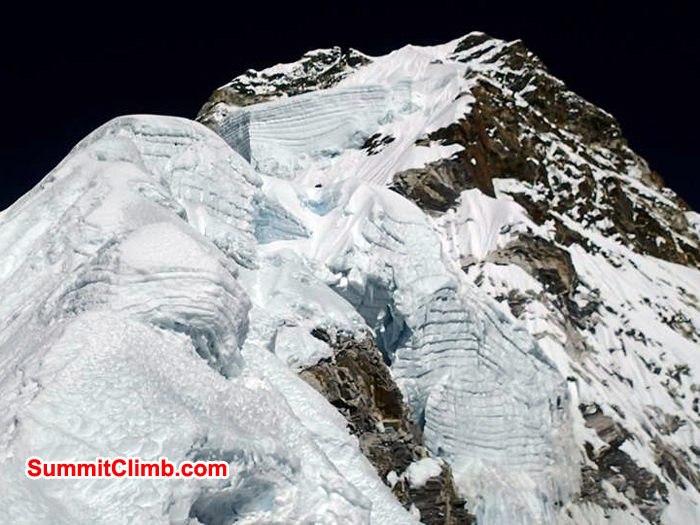 It was our first glimpse of the high altitude rock climbing awaiting us. It was challenging at time, especially the yellow tower for some. Overall a great day. Camp 2 is the craziest camp site I have ever had the pleasure of seeing! 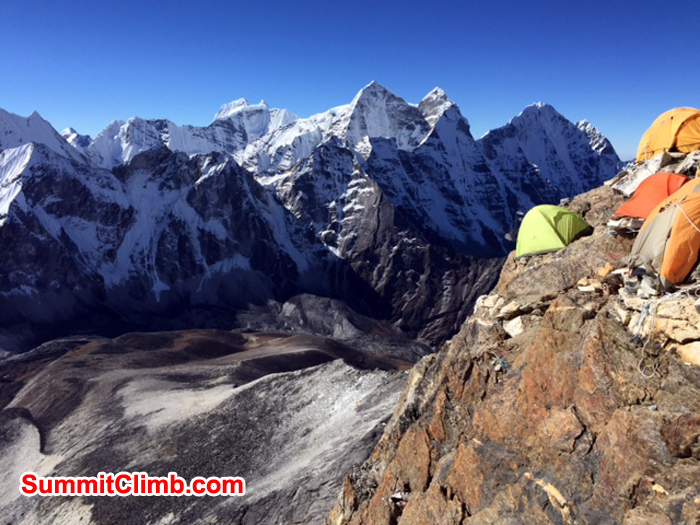 Honestly, google "SummitClimb Ama Dablam Camp 2" Photo and that's where we've been! Going to camp 1. members enjoying camp 1. 21 Oct - Day 10. Rest day. Lapka sherpa birthday. More cake and dancing! All having fun! 20 Oct - Day 9. 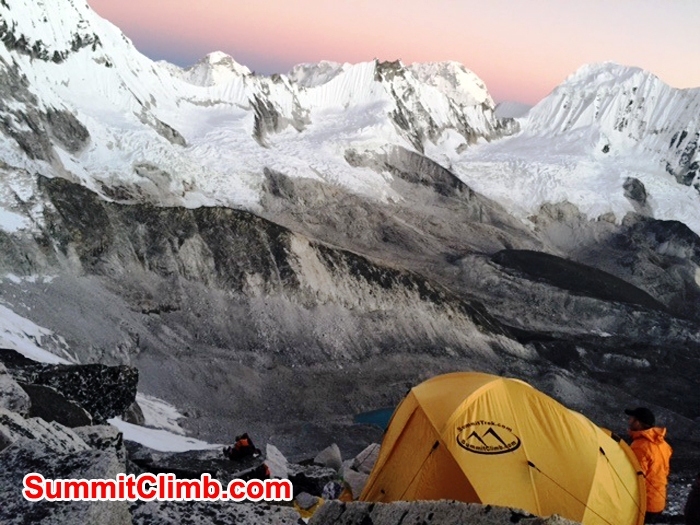 Nine members stayed in abc, explored Camp 1 then back to bc as part of our acclimation process. 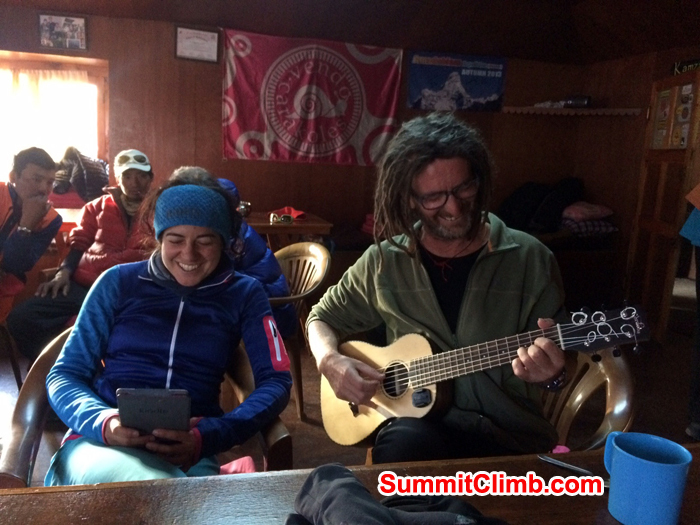 Everyone had a great day and celebrated hollys birthday with lots of sherpa dancing and a wonderful cake! Group 2 were 1 day behind us. 19 Oct - Day 8 : 9 members in ABC 5250m. Sunny but foggy and cold. We stay here tonight and check out camp 1 tomorrow, then head back to bc. The other members will do the same but one day later. We did some more climbing practice this morning in Basecamp which was fun. I am pleased to report we are a full team in base camp now. 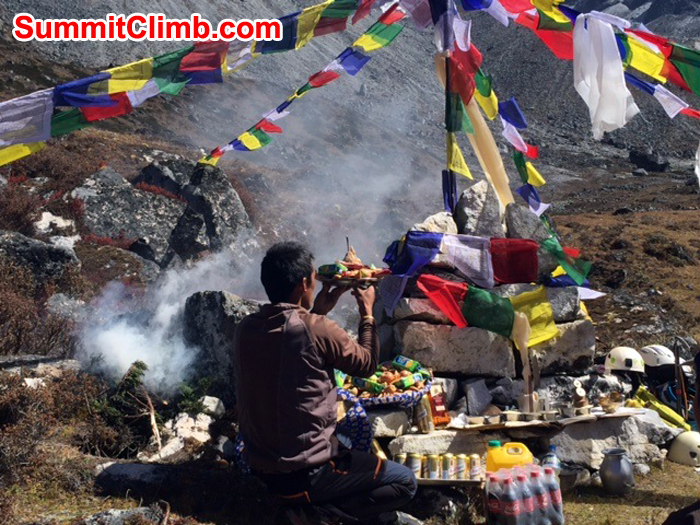 Today we had our mountain puja, a very special ceromony for the sherpas and members too. 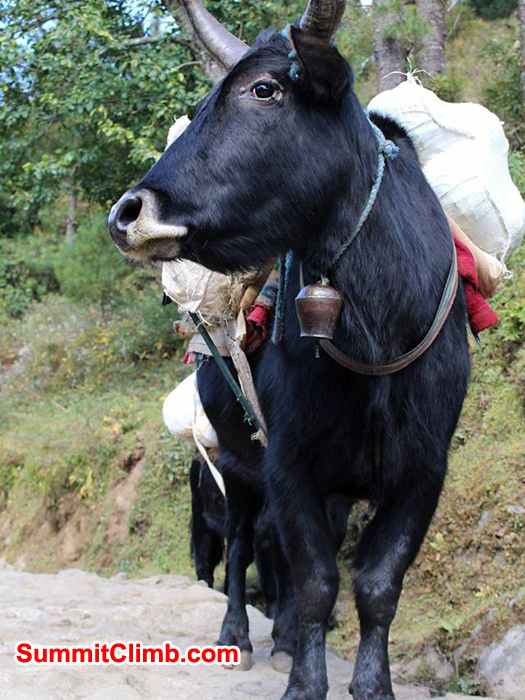 A Lama from Pangboche made his way up to basecamp. 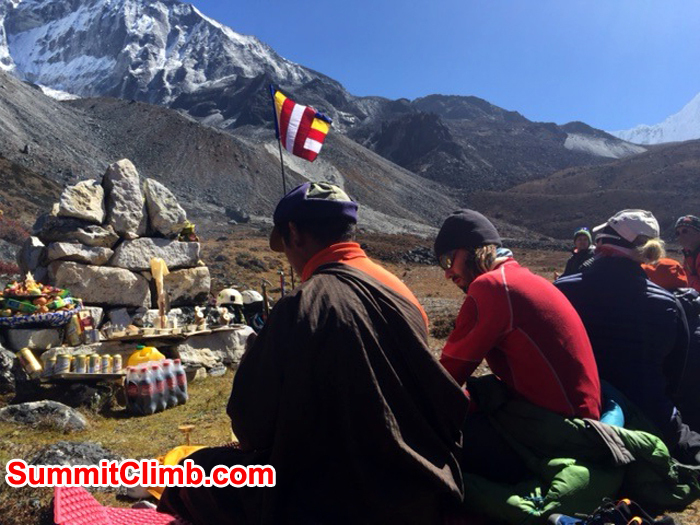 There was a lot of chanting and rice been thrown up in the air, followed by the sherpas putting up the prayer flags to blow in the wind whilst we are on the mountain. All our gear was blessed too. It was a wonderful and special experience which all the members enjoyed. We spent this afternoon looking at our climbing equipment and practising on a nearby rock. A few members are heading up to ABC tomorrow and will stay there for the night. Most of the group are staying in basecamp for a couple more days as we have had some sickness in the camp. Sunny mornings, cold afternoons and nights! Puja ceromoney. 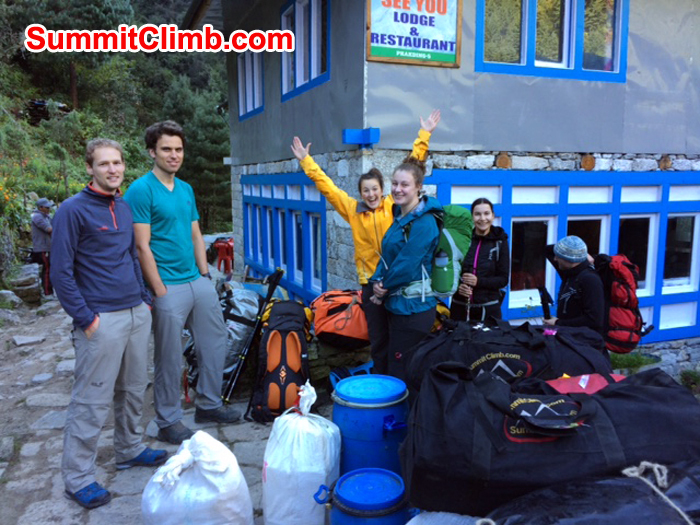 Amadablam summitclimb team ready. 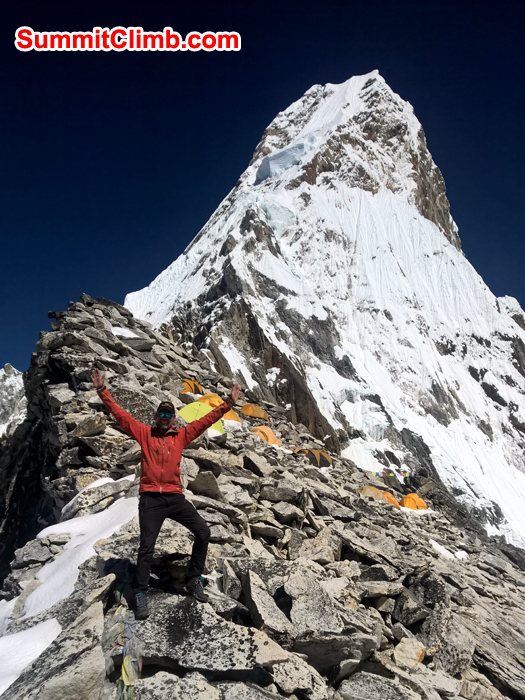 17 Oct - Day 6 ama dablam basecamp. We have all made it to bc, except wolfgang who is taking one day in the lodge. 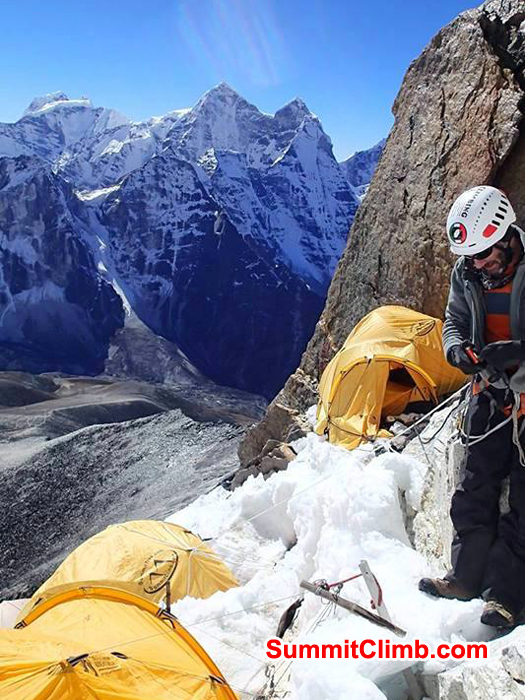 3 members, martin szwad, paul kirk and ed b went to abc to have a look and sherpas went to c1 to set up tents. 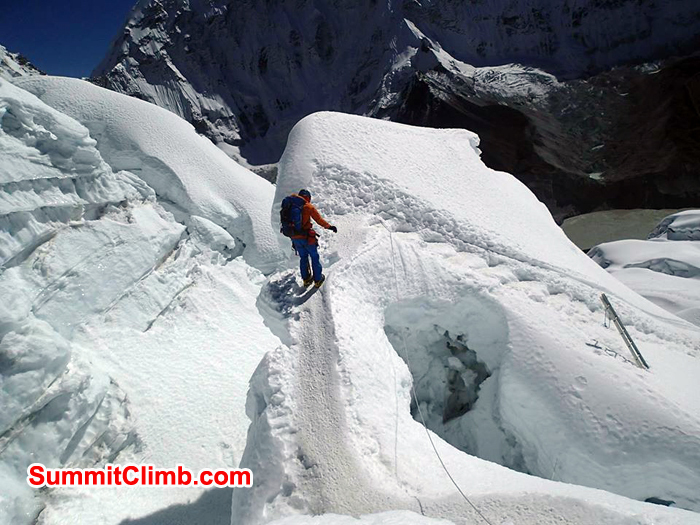 Puja and climbing practice tomorrow. Its cold and foggy today. 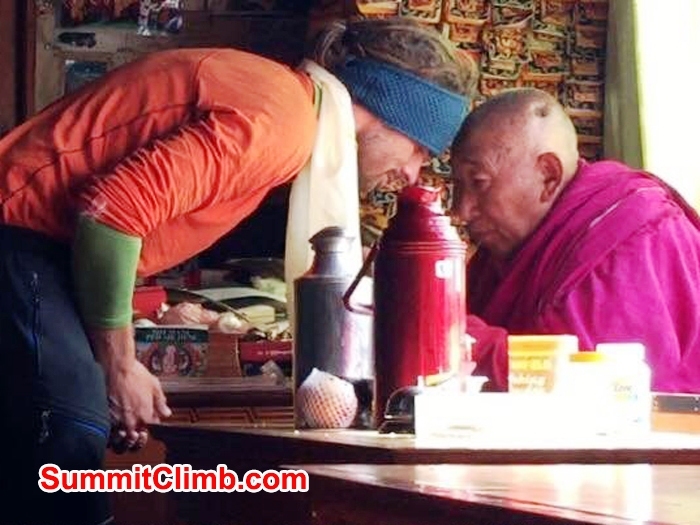 Dave Trevitt being blessed by the Lama. Prayer wheels in Pangboche. Photo Dave. After a long day walking from Namche to Pangboche we spent the night in the Sonam Lodge, eating a warming meal prepared by our cook team and drinking lots of tea to rehydrate! One of our members has brought his guitar along, so we found there were plenty of musicians and singers amongst us!!!! We stayed in the lodge rooms with the added pleasure of a hot shower! Heaven! This morning we had our first puja blessing ceromony asking the mountain gods for safe right of passage up Ama Dablam. The Lama was a lovely cheerful older man, full of fun. We were each presented with a silk scarf and an orange cord necklace which will we wear throughout the trip for good luck. Two of our members, Carmen & Magdalana, sang a song to the Lama which he seemed to enjoy immensely!!! We then went back to the lodge for delicious noodle soup and admiring the view of the mountain. Most of the group made there way to Basecamp, a three hour walk, through the foothills. A couple of the members decided to take an extra rest day in the lodge and will join tomorrow or the next day. Spirits are high. The group dynamic is working very well with lots of lasting friendships being made. Over & out! 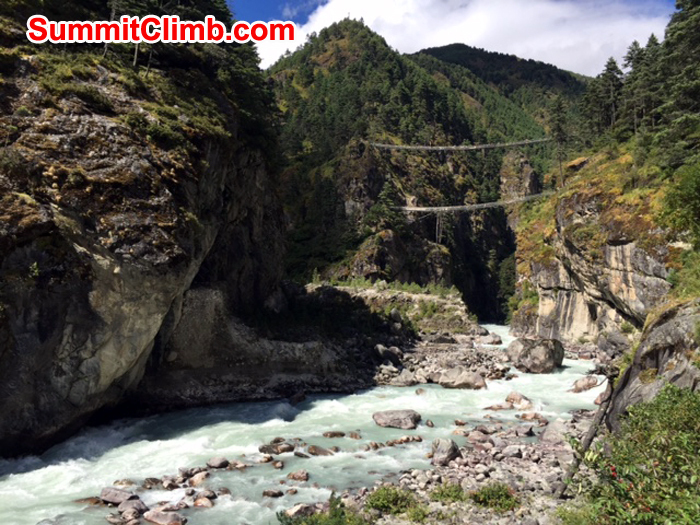 Wonderful view down the Khumbu Valley. Posing by the Tenzing Memorial in Namche. 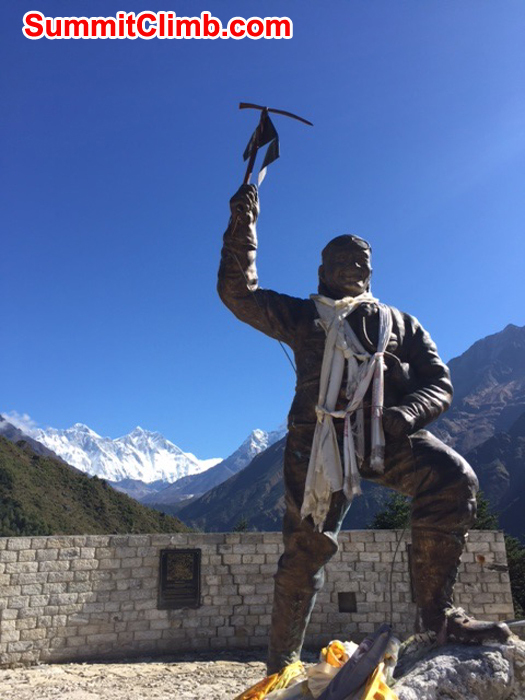 Day began with making a group donation to the Sherwi Kangbe Museum and a group photo at the Tensing Norgay Memorial in Namche Bazaar. 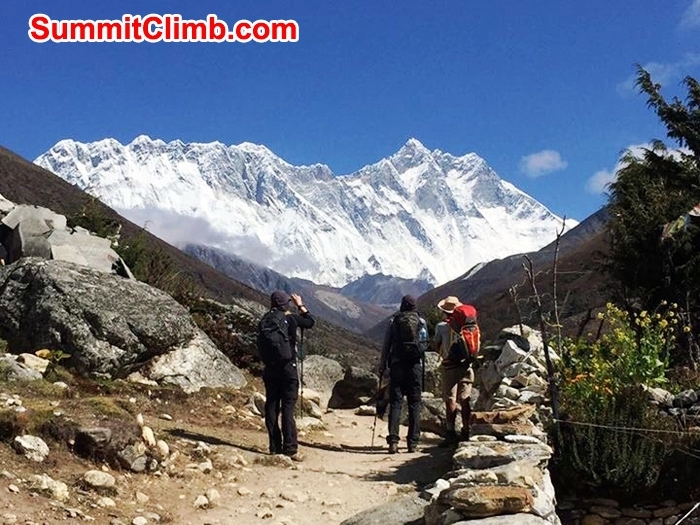 From there we began the trek to Pangboche. 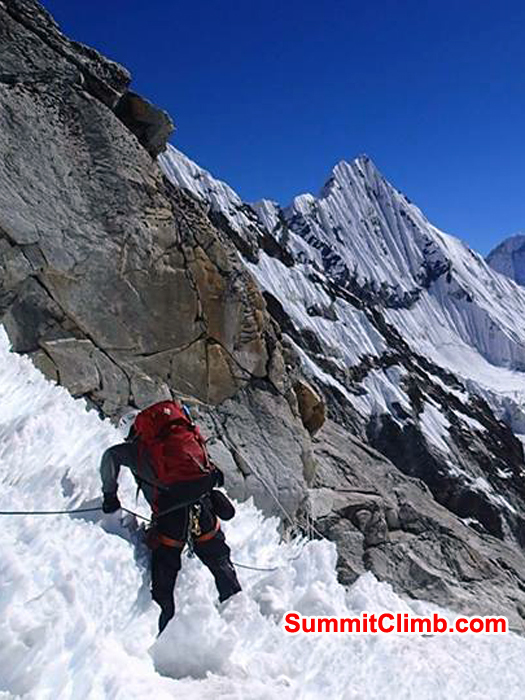 Descending dramatically before the checkpoint it was inevitable their was a steep ascent into Tangboche and many were not disappointed. 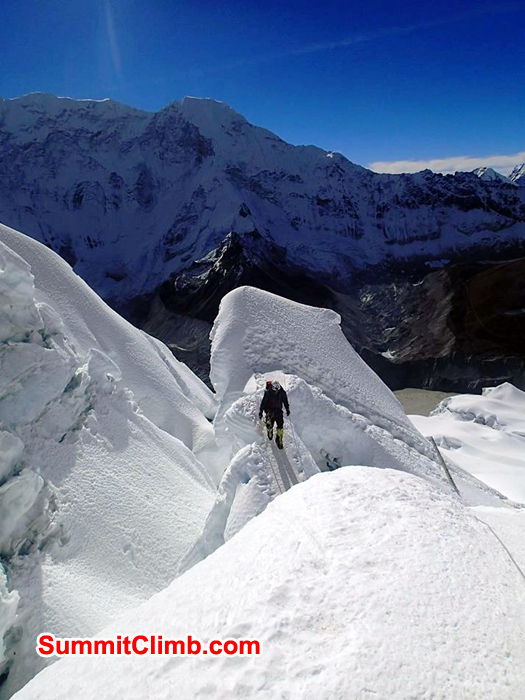 Tangboche was familiar for me being there in 2011. That was the hardest part of the walk. The latter part of the walk was by the river before crossing over a new bridge. 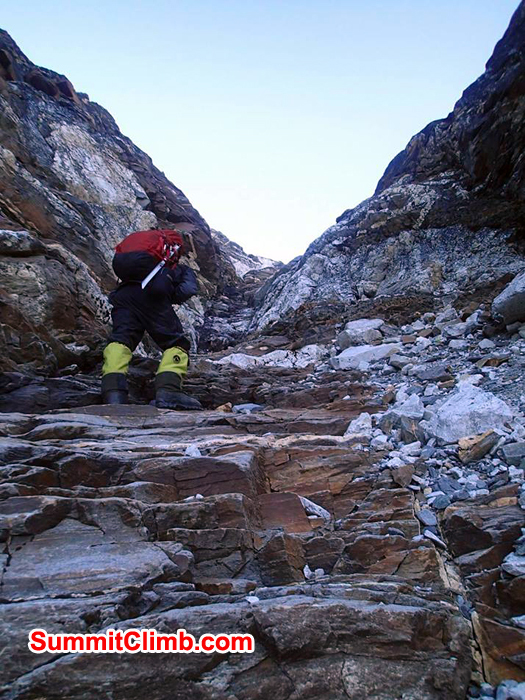 The last part of the walk was an incline into Tangboche. The fields here remind me of the Peak DIstrict stonework walls and patchwork fields. 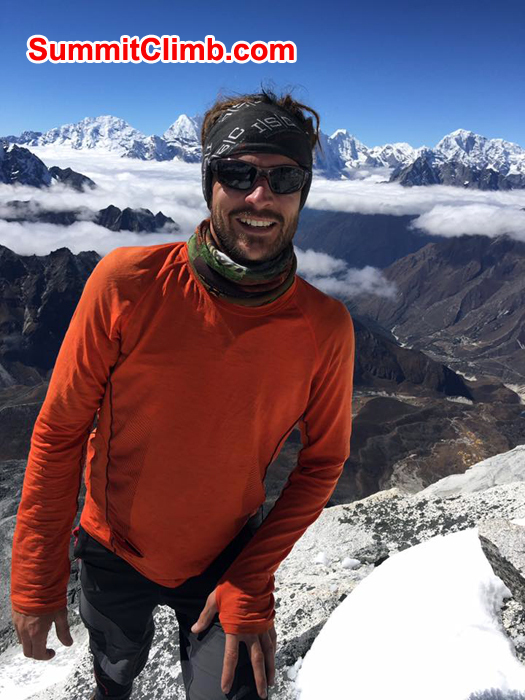 In Tangboche we have met a new team member Paul Kirk. Everybody is good and moving on to Basecamp tomorrow. 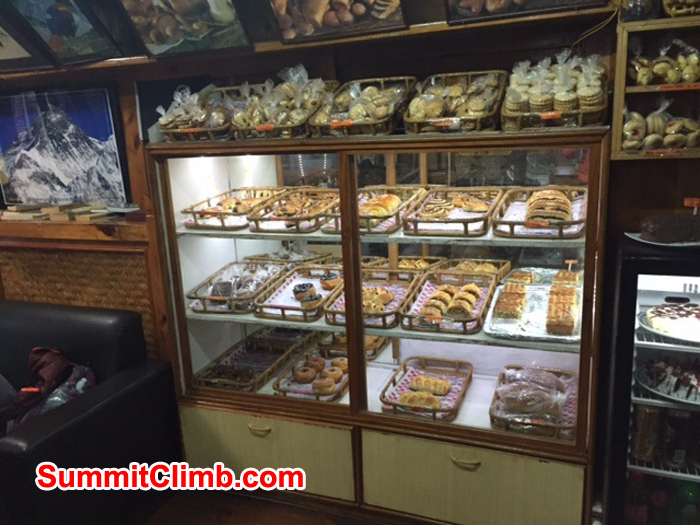 Bakeries at the Namche Bazaar. Photo credit: Dave. 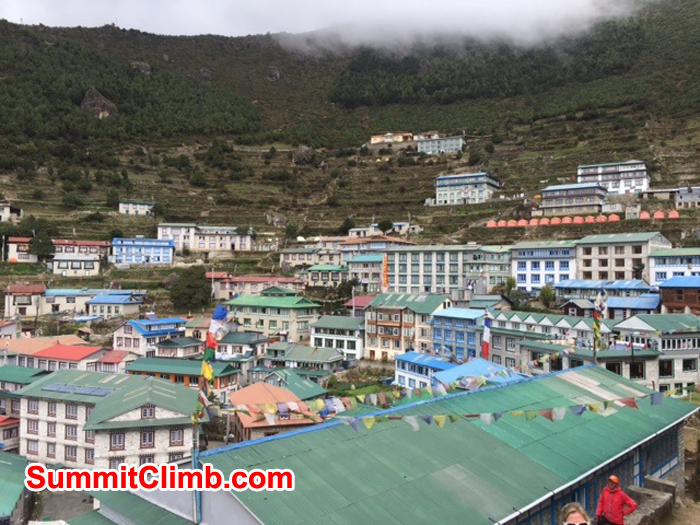 Capital of Khumbu Valley Namche Bazaar. Photo credit: Dave. 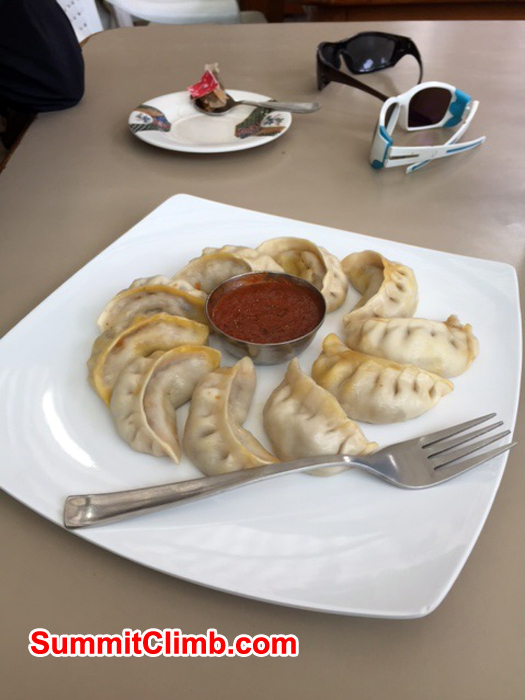 Famous local food of Nepal Momos. Photo credit: Dave. 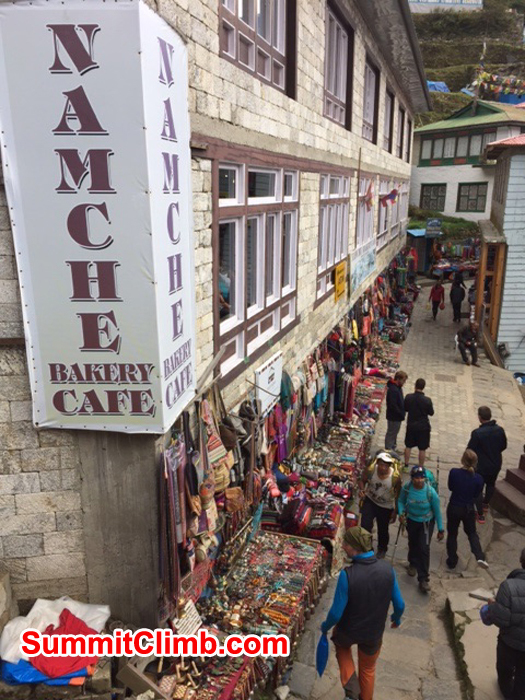 Street of Namche Bazaar for shopping.Photo credit: Dave. A few of us woke early to watch the magnificent sunrise revealing our first glimpse of Ama Dablam and Everest. 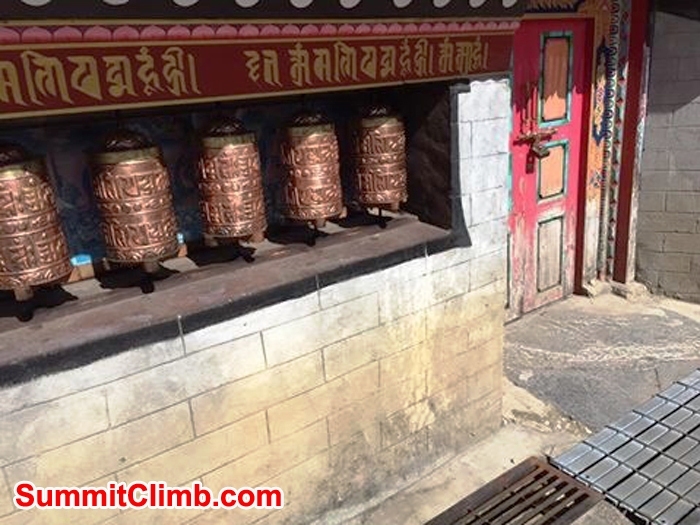 We were still feeling the effects of altitude whilst walking around Namche but loving our rest day and hanging out in the many bakeries eating well earnt cake and Momos. Meanwhile Lakpa and Holly went to the SPCC office to register our climb Andy organise some supplies. Our cook prepared 3 beautiful meals and everyone is feeling good and looking forward to moving on to Pangboche (approx. 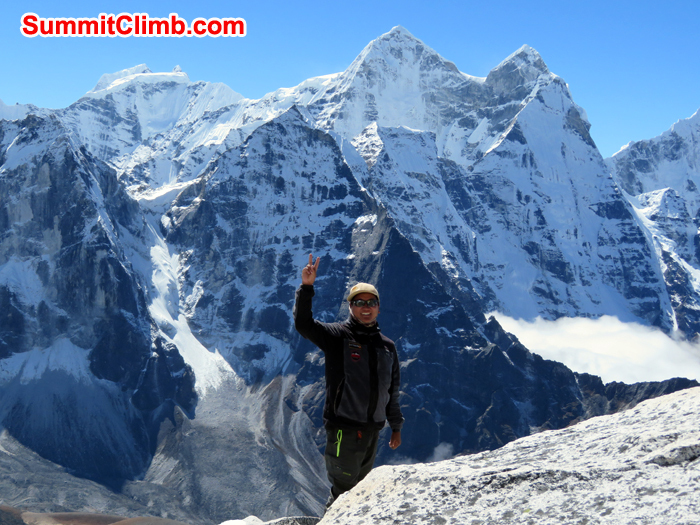 700m higher than Namche), one step closer to base camp! 13 Oct - Day 2 – By Michael Teunis. 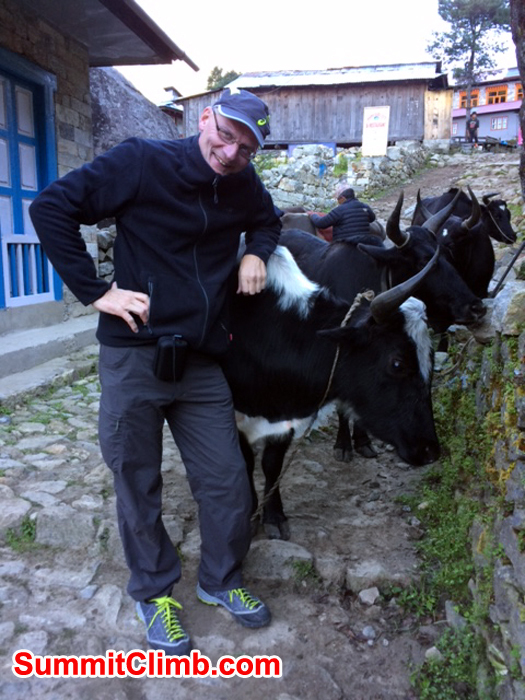 Phakding to Namche Bazaar……. Another beautiful sunny morning. Everyone is excited and keen to get going. 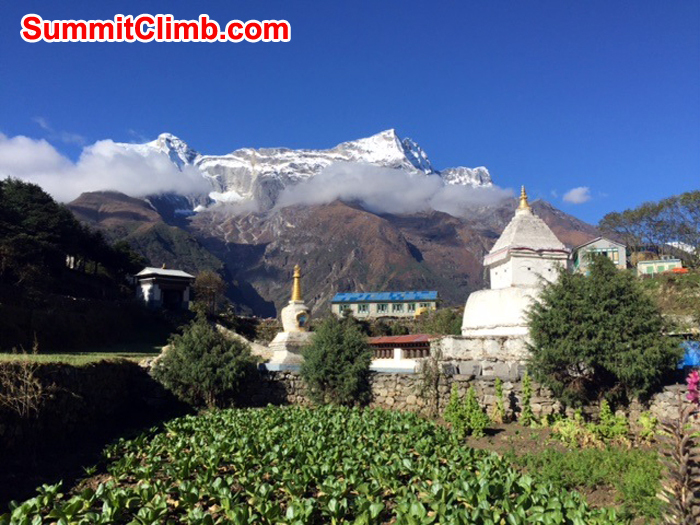 After eggs on toast the walk to Namche was going to test us with a 900m (2950ft) rise in elevation. The walk was hot at times but you can look in any direction at any time and see some of the most spectacular scenery on earth, impossible to take a bad photo. Great getting to know the team as we walk, when we have breath of course as the air is getting thinner the higher we climb. I already sense that we have an exceptional group. Everyone arrived tired but safe to coffess/teas and a luxurious hot shower, well I did anyway lol. Mushroom soup with popcorn for starters at dinner followed by veggies, pasta and potato to fill up on the carbs. 12 Oct - Busy few days in Kathmandu with the members buying last minute supplies, equipment & getting to know each other, we have now traded the big city for the Himalayan foothills. Always a relief to get the flight into Lukla out of the way, it is the one of the worlds shortest, highest runways and definitely an experience!. Most of our bags have arrived which is a good start! We are now resting and acclimatising (& drinking tea in Starbucks!) before hiking down to Phakding for the night. All members are happy & well.